Diane van Schoor was the invited Guest at the Canadian Board of Examiners meeting Feb 3-5, 2016 at Canada’s National Ballet School in Toronto. After a wonderful day of observing classes at the School, we discussed Cecchetti principles, general expectations for examining Licentiate and Fellowship and the future of this great method. We reviewed in depth the Final Diploma syllabus as a group and Miss van Schoor initiated many stimulating and thought-provoking discussions. In all our discussions Miss van Schoor shared her knowledge and artistry with great generosity and encouraged everyone’s input. It was a motivating and inspiring three day meeting for us all. 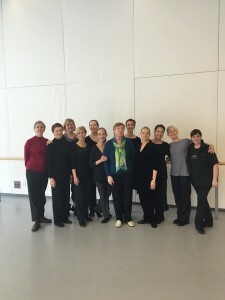 From L to R: Carina Bomers, Joyce Shietze, Mary Ross, Christine Richardson, Jane Wooding, Suzanne Plante, Valentina Gurovsky (pianist), Bleiddyn Bellis, Diane van Schoor, Margaret Dalwood, Deborah Bowes and Rosalie Deligioridis.